Crafts for kids by kids! With Christmas decorations already filling the shelves at all the stores this year it makes me think of the often forgotten Thanksgiving holiday. Why should we skip over this fun holiday of family and food. It is a great opportunity for creating and sending printable Thanksgiving cards, parting invitations or table decorations. 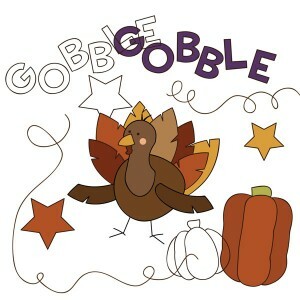 Download our free Gobble Thanksgiving Pumpkin & Turkey Stamp Set. I love creating cards, invitations and other fun Thanksgiving decorations using printable stamps. This printable stamp set contains a turkey, two pumpkins, some stars, some squiggles and the word Gobble. These files can be printed, used in a photo editing software like Adobe Photoshop Elements or you can even add then to Microsoft Word documents. In your printable stamp download you will get two easy print PDF files. One in color and one in black and white. You will also receive a color and black and with version of each digital stamp saved as transparent PNG files. I recommend printing on a bright white card stock. This is a printable sticker set for Dad. It comes in color and black and white. It is the perfect clip art to print and add to your Father’s Day card or poster. This comes as an easy print PDF.